Has this ever happened to you? You wake fresh, grab your board, hit the beach and look out at nothin’ but Ankle Snappers (or Breakers for the Easties). Or worse, the good surf is so blown out and brutal that gnarly doesn’t even describe the half of it. Dont be a baller, be a coolaphonic crusher while waiting for the next bomb – all while staying true to your crew. Bombwatcher Surfboard Chairs are the worlds first ever Fold-to-Flat surfboard styled chairs that look as bitchin’ in transit as they do posted up. 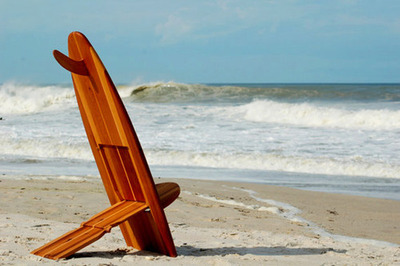 Made from high quality cedar & oak chairs, each are hand-crafted by creator & designer Clinton Underwood in Cocoa Beach, Florida. These wicked ‘elephant gun-esque’ boards aren’t at just any beach-house, to purchase one you’ve got to hit up ol’ Underwood directly at Bombwatcher. The best part of all is that they’re fully customizable. You can get them Painted, Monogrammed, Wood Burned, Polyurethane or Glassed and all factory direct. They’ll even skip the Varnish and give you an Oil Finish only should you wish. So the next time you bail, check your cavefish status at the shore, grab a Bombwatcher and pull Bettys, Bunnies and Babalini’s all day in true Big Kahuna style.